I’m always a fan of a good noodle bowl with spicy vegetables but during the summer months, I get a real treat: fresh green beans. Green beans are one of my favorite stir-fry vegetable because they hold a bit of their crispness even when cooked but still absorb and work well with a variety of sauces. 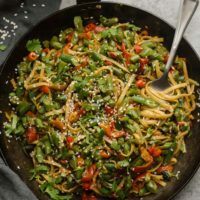 This green bean stir-fry is a slight riff on this vegetable lo mein bowl because the sauce is easy and one of my favorites. I keep a small package of miso in the refrigerator, which I highly recommend. It’s great in sauces and especially lovely as an addition to my favorite veg burger. 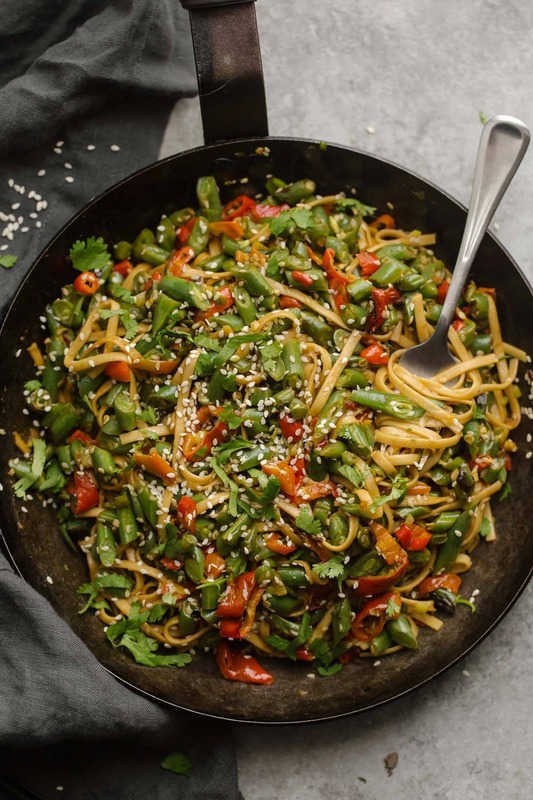 A perfect way to showcase fresh summer green beans, this stir-fry is a little sweet and a little spicy. Cook noodles according to package, set aside. Trim the ends from the green beans then slice into 1″ pieces. Thinly slice the scallions and pepper(s). Heat a large skillet over medium heat. Add 2 teaspoons sesame oil to the pan and swirl around. Add the onions and peppers, cooking for 4 minutes or so then add in the green beans. Continue to cook for a two minutes, cover, and let cook until the green beans are almost tender, 5 to 6 minutes. Uncover, turn up heat slightly and continue to cook until the beans and red peppers are starting to char. Stir in the sesame seeds, cooking for a minute more. Transfer green bean mixture to a bowl. Returning back to the pan, heat remaining 2 teaspoons sesame oil. Add the noodles to the pan and cook, stirring occasionally, for 2 to 3 minutes. Whisk the ingredients for the sauce together and pour in to the pan, coating the noodles and cooking for a minute. Add the green bean mixture back in to the pan and toss everything until well combined. If you’re pan isn’t big enough, transfer to a bowl and toss together. Tips and Tricks: To get the nice char on the green beans, resist the urge to over stir while they are cooking. The long the contact with the pan, the better the char! Noodles: If you can’t find lo mein, try using udon or soba. If you’re looking for a gluten-free alternative, try 100% buckwheat soba noodles or brown rice noodles. Spice: Not a fan of spice? Drop the sambal oelek, the sauce will still be good. If you can’t find sambal oelek, sriracha will work as well. Onions: If you can’t find scallions during the summer months, regular onion will work. I just like to slice the onion really thin. 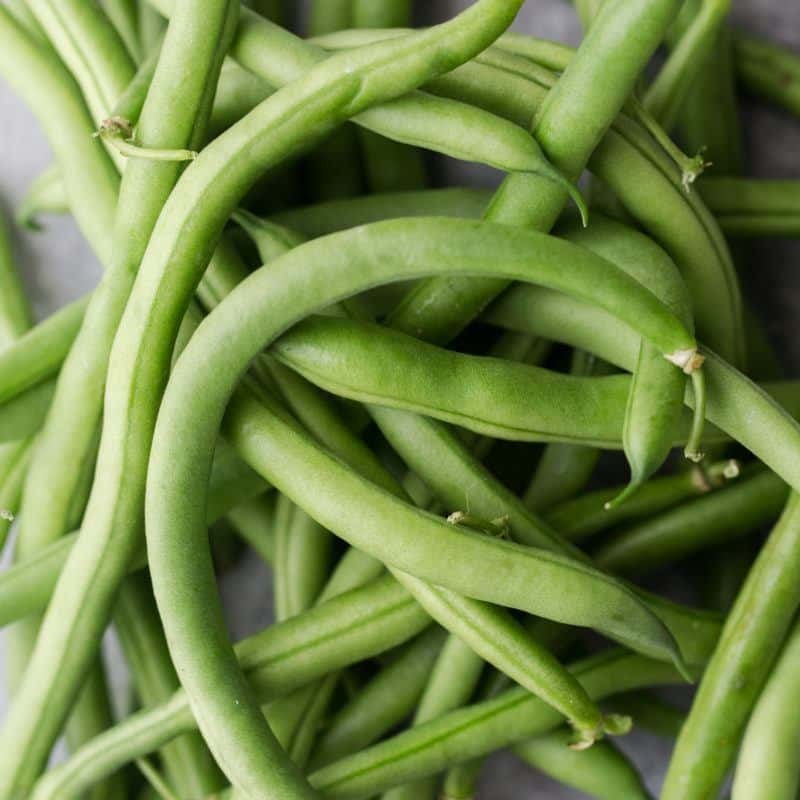 We’re starting to exit green bean season but before we do, pick up a pound and make them the star of dinner. Fresh green beans are a treat in vegetarian cooking and are one of my top flavors of summer. You can also use different varieties of green beans, chopped up pole beans, or long beans work as well. It look amazing and easy enough for me to try it! Ella, I have a bunch of mangos and no idea what to do with them…do you happen to know a healthy, easy recipe for a mango dessert? I could google it, but it would take me forever to find something. Besides, I love your recipes: they’re always delicious, healthy and easy to make! It looks awesome, and super easy! Hello! I’m Sara and I’m from Spain, I don’t speak english very well so I’ll try to write this message correctly haha. 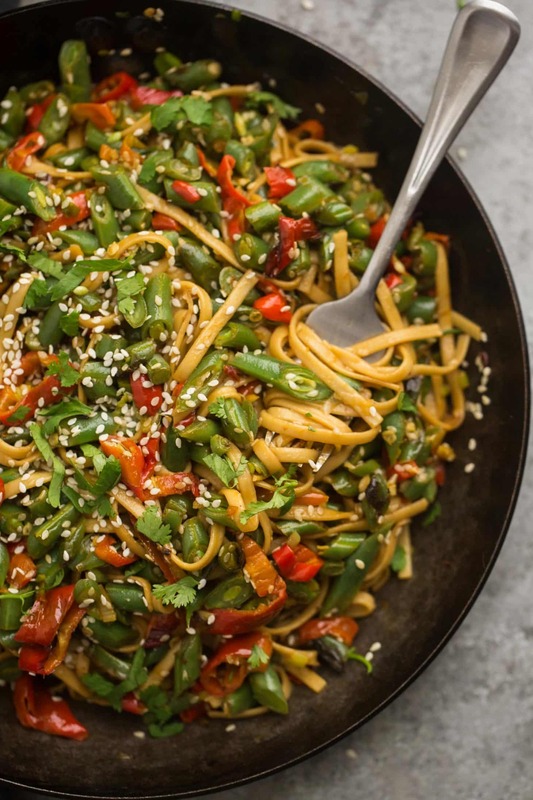 I made your Green Bean Stir-Fry recipe and it was amazing! I really like your youtube channel and your website so you have won a subscriber 🙂 Thank you! This was a delicious meal! I will defensively make it again and will try it with asparagus ( my favorite veg) Thank you for creating the recipe. I’m not at all experienced with miso. The only kind of miso I could find in the store was a white miso (although it’s actually reddish/brownish in color). 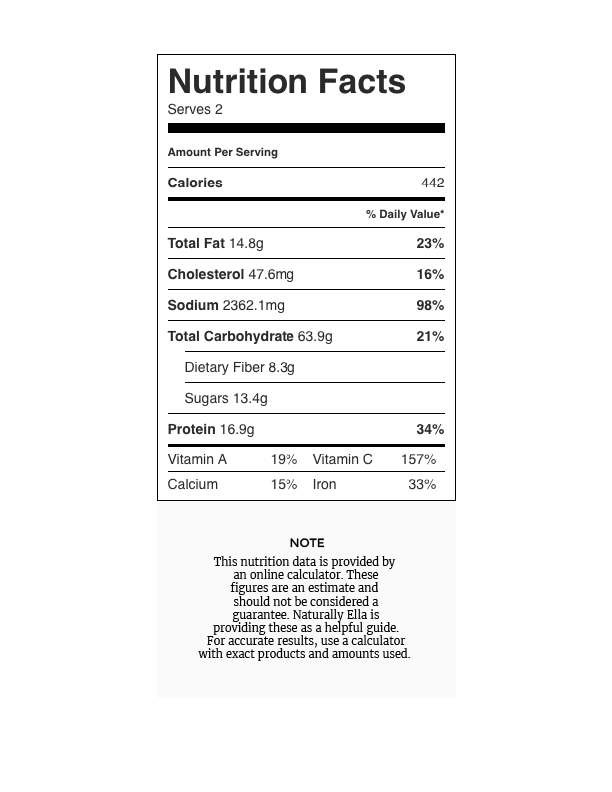 The ingredients include soybeans and rice… does that work? I’m totally clueless here. Also, I just discovered your blog recently and I totally love it! I glad to see you’re enjoying Sacramento, it really is a wonderful place. I grew up in Loomis, but now live in the midwest. The different kinds of miso usually represents the kind of fermented item it is which usually is an indication of flavor. So, white miso is just fine- the flavor might be a bit more subtle but it will still taste delicious! I found some fresh green beans at the farmer’s market and made this recipe. Amazing!! My hubby loved it, too. Definitely a keeper.